Last weekend was the start of the Iame X30 championship at Genk International Karting Circuit, Belgium. 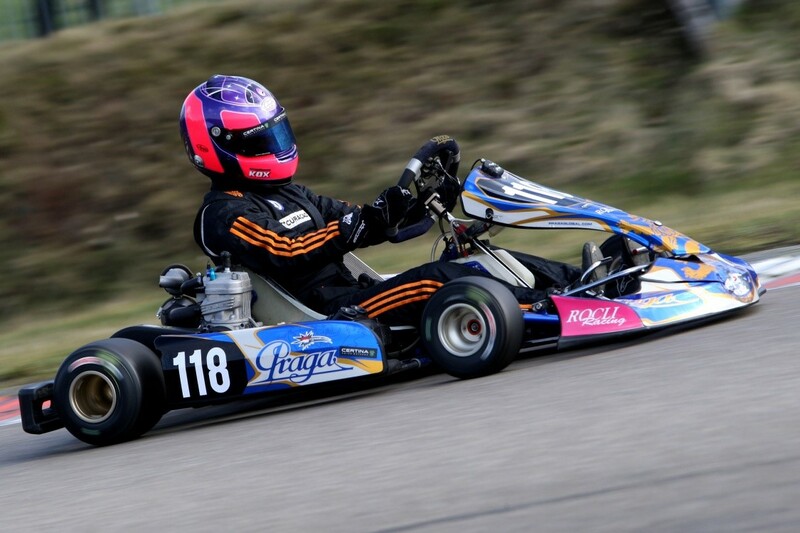 Stéphane participated for the first time in this class with Rocli Racing on a Praga kart. As she had to get used to this new equipment, the weekend started already on Thursday. The first day of testing went quite well. At Friday and Saturday, the weather was very bad and therefore they were not able to work on a ‘dry’ set-up. Sunday was raceday. As it rained overnight, the track was still wet on Sunday morning, but of course it became dryer every time. Stéphane and her mechanic chose for slick-tires in qualifying. In the end, this was not the right decision. She had to start the first race from P17.. The start of the first race was a chaos and she got involved in a start crash. However, she was very competitive posting fastest lap of the race and drove from 17th to 9th with some great overtaking manouvers. This meant she had to start p9 in the second race. The speed was there, she drove the same laptimes as the driver who won the race. She finished this race at P5. The start-grid of the last race was based on the results of the first and the second race. Stéphane had to start 6th. This race she finished 3th and drove the fastest laptime of the day in class! In the end, Stéphane finished P3 in class! She is very happy with this result, as it was her first time with the X30 and the speed was there. This was a very promising start of the season. Stéphane wants to thank Rocli Racing for the great effort and support.